Tasha has been with next level tattoo studio since April 2016, she has just entered her 5th year of tattooing. Her style tends to have a bold, solid, finish to it with a modern traditional edge, though she does also enjoy working in the same style but with a finer line. She very much likes tattooing pieces that take inspiration from decorative art, anything from Paisley textiles to floral artistic works. 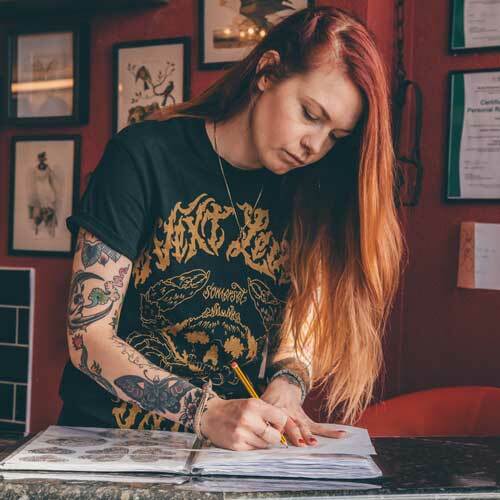 Originally from Cambridgeshire where she gained a national diploma in art and design, she moved to Lincolnshire to study a degree in fashion design and illustration; basing her dissertation on bodily adornment and modification, she worked at a few creative jobs whilst getting tattooed in her spare time until eventually getting a tattoo apprenticeship. She mainly tattooed at Skinfolk tattoo studio and has guested at a few studios up and down the UK.